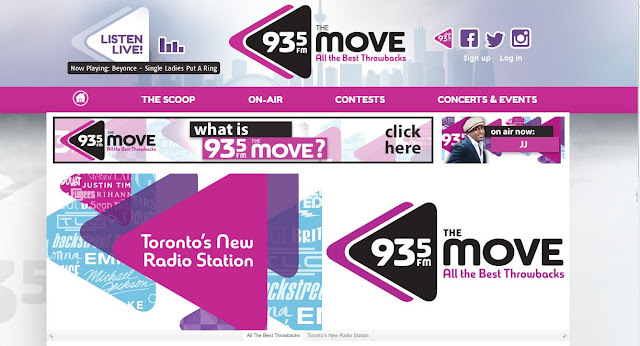 Newcap Radio outlet “93.5 The Move” (CFXJ-FM) Toronto has added currents and has re-classified itself as a Rhythmic CHR station. The station will now image itself as "Toronto's Hits. Toronto's Throwbacks." The station flipped to Pop Top 40 Throwbacks in Februrary of 2016 as 'The Move" after a very successful run as one of the very few Urbans in Canada as 93.5 The Flow. The brand was as strong over the last 15 years in Hip Hop radio on an international basis as New York's Hot 97 and the UK's BBC Radio 1. Artists like Cardi B., Kendrick Lamar, Khalid, and Bruno Mars- and less Biggie and Prince are now featured on The Move's new playlist. Here's a snippet of the article from Toronto's Now at the time of the format change. On Monday, February 29, 2016 the radio station rebranded as 93-5 The Move, marking the latest evolution in CFXJ-FM’s 15-year history. It launched as a hip-hop (or “urban contemporary”) station before becoming a top-40 pop station and (as of last year) a classic hip-hop/R&B station, with recent pop hits by Taylor Swift, the Weeknd and Drake mixed in. Owner Newcap Radio, which bought the station and sister network Boom 97.3 from Bell Media in 2013, rebranded as The Move to reflect the station’s new emphasis on throwback pop hits from the 1990s and 2000s. Since competitors like Virgin, CHUM and KISS are focused on reeling in 18-to-24-year-olds with current pop music, Parsons sees an opportunity to go after the slightly older 25-to-34 demographic. “We think there’s a greater opportunity to excel ratings-wise in that demo,” he says. Listeners can expect to hear more Michael Jackson and Prince hits than before, as well as Madonna, No Doubt, Gwen Stefani, Britney Spears, Backstreet Boys, Lady Gaga, Love Inc., Katy Perry and Flo Rida, among others. The move to "The Move" did not go over well with listeners. Now with low ratings the station has moved away from pop throwbacks to add currents that will be heavy on Hip Hop. Which in essence is what the station use to feature as 93.5 The Flow. Sounds like The Flow should have never been flipped to The Move. Perhaps a return to its former name is next.